Outbreak Assault will be on October 18, 2014. Registration for the event will start on September 18, 2014. Registration will be until October 17, or until all slots are filled up--whichever goes first! 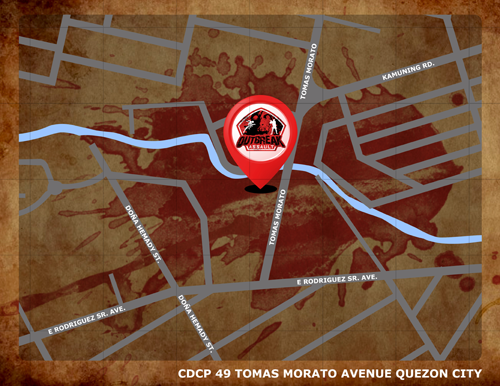 Outbreak Assault will be in 49 Tomas Morato Avenue, Quezon City. Here is a link to the map. Only 150 lucky people will experience this one-of-a-kind-event! Price is only P1500 per person. Aside from an epic experience, survivors also get a souvenir dogtag to represent their zombie survival skills. OPTION 1: Online Reservation and Payment. This is the quickest and easiest way to guarantee your preferred timeslot for you and your friends. Note that there is a P50 additional fee per person for this payment method. Still a bit wary of online transactions? That's ok. We can do it the old fashioned bank deposit way. Send us an email at support@outbreakmanila.com with the email SUBJECT: OUTBREAK ASSAULT RESERVATION. Please note that since accommodating your email may take some time, please indicate 3-5 preferred options of your preferred TIMESLOT, and HOW MANY you are in the group. Pay through PayPal or credit card! Note: You don't need to have a Paypal Account to pay via Credit Card here.